When you invoke the healing of the angels they will assist you, often guiding you to make healthy lifestyle changes yourself. They will also work with you energetically by connecting you with the ultimate healing force in the universe, Love! All 7 Healing With The Angels Meditations Are Now Available For Only $37! Embody the qualities and gifts of the Divine you desire. In this very moment you are connected to an infinite number of alternate realities. By “dimensional hopping” you can align with the aspect of yourself that already is in alignment with what you’re wanting and seeking. Align with healing, love and abundance, by uniting with your alternate self which has this already. Physical pain, emotional distress, and even illness or disease can be caused and healed energetically. You have the natural ability to connect with healing blessings of the Divine which this meditation will help you to connect with. As you listen you will be guided to clear your mind, open your heart and purify your mind, body and spirit to bring powerful blessings of healing and well being directly from the Divine into your life. Release tension so you can realign with your full vibrant and thriving self. Archangel Uriel connects with a wonderful message and a powerful angelic frequency to assist you in opening your energetic centers, increasing your vibration, and naturally releasing tension, density and stress to promote healing and well-being. 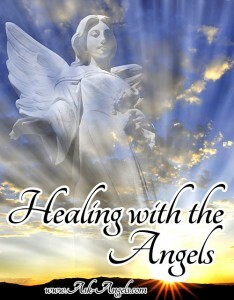 Get all of these powerful meditations which will help you to experience Healing With the Angels. Now Available For Only $37! Hi, Melanie I love reading your post about all the Archangels and their special duties and that I can asked to connect with my needs to healing. Now I have a close friend that needs my help and he don’t believe in any of this stuff so how could I help him, when he is gravely ill? how nice if you can drop me some line of advice that I can say with out his knowledge? Thank you so much once again I love what you’re doing. THANKYOU SO MUCH MELANIE FOR ALL YOUR WORK AND HELP.ITS SO STRANGE BUT YOU ALWAYS SEND A EMAIL.AT JUST THE RIGHT MOMENT WHEN I AM IN NEED OF ASSISTANTS. Thankyou Melanie. you’re supper cool I really enjoy your readings its nic n reveling. u are too accurate.